At 9:40 p.m., September 11, members of Ansar al-Sharia attacked the American diplomatic compound in Benghazi resulting in the deaths of U.S. Ambassador to Libya J. Christopher Stevens and U.S. Foreign Service Information Management Officer Sean Smith. Stevens was the first U.S. ambassador killed in the line of duty since 1979. At around 4:00 a.m. on September 12, the group launched a mortar attack against a CIA annex approximately one-mile (1.6 km) away, killing CIA contractors Tyrone S. Woods and Glen Doherty and wounding ten others. Initial analysis by the CIA, repeated by top government officials, indicated that the attack spontaneously arose from a protest. Subsequent investigations showed that the attack was premeditated – although rioters and looters not originally part of the group may have joined in after the attacks began. The National Review later labeled the attack Battle of Benghazi, a name that has since been used by several media outlets to refer to the attacks. There is no definitive evidence that al-Qaeda or any other international terrorist organization participated in the Benghazi attack. The United States immediately increased security worldwide at diplomatic and military facilities and began investigating the Benghazi attack. Many Libyans condemned the attacks. They staged public demonstrations condemning Ansar al-Sharia, which had been formed during the 2011 Libyan civil war in opposition to leader Colonel Muammar Gaddafi. Despite persistent accusations against President Obama, Hillary Clinton, and Susan Rice, ten investigations — six by Republican-controlled congressional committees — did not find that they or any other high-ranking Obama administration officials had acted improperly. Four career State Department officials were criticized for denying requests for additional security at the facility prior to the attack. Eric J. Boswell, the Assistant Secretary of State for Diplomatic Security, resigned under pressure, while three others were suspended. In her role as Secretary of State, Hillary Clinton subsequently took responsibility for the security lapses. On August 6, 2013, it was reported that the U.S. had filed criminal charges against several individuals alleged to have been involved in the attacks, including militia leader Ahmed Abu Khattala. Khattala has been described by Libyan and U.S. officials as the Benghazi leader of Ansar al-Sharia. The U.S. Department of State designated Ansar al-Sharia as a terrorist organization in January 2014. Khattala was captured in Libya by U.S. Army Special Operations Forces, who were acting in coordination with the FBI, in June 2014. Another suspect, Mustafa al-Imam, was captured in October 2017. Within months of the start of the Libyan revolution in February 2011, the CIA began building a covert presence in Benghazi. During the war, elite counterterrorist operators from U.S. Delta Force were deployed to Libya as analysts, instructing the rebels on specifics about weapons and tactics. :16 Ambassador J. Christopher Stevens was named the first liaison with the Libyan opposition in March 2011. After the end of the war, both the CIA and the U.S. State Department were tasked with continuing to identify and collect arms that had flooded the country during the war, particularly shoulder-fired missiles taken from the arsenal of the Gaddafi regime, as well as securing Libyan chemical weapons stockpiles, and helping to train Libya's new intelligence service. Multiple anonymous sources reported that the diplomatic mission in Benghazi was used by the CIA as a cover to smuggle weapons from Libya to anti-Assad rebels in Syria. :56 Investigative journalist Seymour Hersh cites an anonymous former senior Defense Department intelligence official, saying "The consulate's only mission was to provide cover for the moving of arms. It had no real political role." The attack allegedly brought an end to the purported U.S. involvement, but did not stop the smuggling according to Hersh's source. In January 2014, the House Permanent Select Committee on Intelligence cast doubt on this alleged U.S. involvement and reported that "All CIA activities in Benghazi were legal and authorized. On-the-record testimony establishes that the CIA was not sending weapons ... from Libya to Syria, or facilitating other organizations or states that were transferring weapons from Libya to Syria." During Congressional hearings, Ambassador Stevens' top deputy in Libya, Gregory N. Hicks, testified that Ambassador Stevens was in Benghazi in 2012 because "Secretary [of State Hillary] Clinton wanted the post made permanent", and it was understood that the secretary hoped to make an announcement to that effect during a visit to Tripoli later in the year. He also stated that "Chris [Stevens] wanted to make a symbolic gesture to the people of Benghazi that the United States stood behind their dream of establishing a new democracy." In April 2012, two former security guards for the consulate threw an IED over the consulate fence; the incident did not cause any casualties. Just four days later, a similar bomb was thrown at a four-vehicle convoy carrying the United Nations Special Envoy to Libya, exploding twelve feet (3.7 m) from the UN envoy's vehicle without injuring anyone. In May 2012, an Al-Qaida affiliate calling itself the "Brigades of the Imprisoned Sheikh Omar Abdul Rahman" claimed responsibility for an attack on the International Red Cross (ICRC) office in Benghazi. On August 6, the ICRC suspended operations in Benghazi. The head of the ICRC's delegation in Libya said the aid group was "appalled" by the attack and "extremely concerned" about escalating violence in Libya. The Brigades of the Imprisoned Sheikh Omar Abdul Rahman released a video of what it said was its detonation of an explosive device outside the gates of the U.S. consulate on June 6, which caused no casualties but blew a hole in the consulate's perimeter wall, described by one individual as "big enough for forty men to go through". The Brigades claimed that the attack was in response to the killing of Abu Yahya al Libi, a Libyan al-Qaeda leader who had just died in an American drone attack, and was also timed to coincide with the imminent arrival of a U.S. diplomat. There were no injuries, but the group left behind leaflets promising more attacks against the U.S.
British ambassador to Libya Dominic Asquith survived an assassination attempt in Benghazi on June 10. Two British protection officers were injured in the attack when their convoy was hit by a rocket-propelled grenade 300 yards (270 m) from their consulate office. The British Foreign Office withdrew all consular staff from Benghazi in late June. According to a local security official, he and a battalion commander had met with U.S. diplomats three days before the attack and warned the Americans about deteriorating security in the area. The official told CNN that he advised the diplomats, "The situation is frightening; it scares us." Ambassador Stevens' diary, which was later found at the compound, recorded his concern about the growing al-Qaeda presence in the area and his worry about being on an al-Qaeda hit list. U.S. security officer Eric Nordstrom twice requested additional security for the mission in Benghazi from the State Department. His requests were denied and according to Nordstrom, State Department official Charlene Lamb wanted to keep the security presence in Benghazi "artificially low". In the months [between February 2011 and September 11, 2012] leading up to the attack on the Temporary Mission Facility in Benghazi, there was a large amount of evidence gathered by the U.S. Intelligence Community (IC) and from open sources that Benghazi was increasingly dangerous and unstable, and that a significant attack against American personnel there was becoming much more likely. While this intelligence was effectively shared within the Intelligence Community (IC) and with key officials at the Department of State, it did not lead to a commensurate increase in security at Benghazi nor to a decision to close the American mission there, either of which would have been more than justified by the intelligence presented. ... The RSO [Regional Security Officer] in Libya compiled a list of 234 security incidents in Libya between June 2011 and July 2012, 50 of which took place in Benghazi. The desire of the State Department to maintain a low profile in Benghazi has been cited as the reason why the State Department circumvented their own Overseas Security Policy Board (OSPB) standards for diplomatic security. :74–75 In the aftermath, Clinton sought to take responsibility for the security lapses at Benghazi and expressed personal regret. In her January 2013 testimony before Congress, Secretary Clinton claimed security decisions at the Benghazi compound had been made by others, stating, "The specific security requests pertaining to Benghazi ... were handled by the security professionals in the [State] Department. I didn't see those requests, I didn't approve them, I didn't deny them." The Benghazi attack was conducted by separate military factions on two separate U.S. compounds. The first assault occurred at the main diplomatic compound, approximately 300 yards (270 m) long and 100 yards (91 m) wide, at about 9:40 p.m. local time (3:40 p.m. Eastern Time). A mortar fire attack on a CIA annex 1.2 miles (1.9 km) away (coordinates 32°03′26″N 20°05′16″E﻿ / ﻿32.0572°N 20.0877°E﻿ / 32.0572; 20.0877﻿ (CIA annex)) began at about 4:00 a.m. the following morning and lasted for 11 minutes. One Libyan guard who was wounded in the attack was quoted as saying "there wasn't a single ant outside [before the attack]." According to Media Matters For America, the attackers stated they were acting in response to Innocence of Muslims. No more than seven Americans were in the compound, including Ambassador Stevens. Stevens was visiting Benghazi at the time to review plans to establish a new cultural center and modernize a hospital. The ambassador also "needed to [prepare a] report ... on the physical and the political and security environment in Benghazi to support an action memo to convert Benghazi from a temporary facility to a permanent facility". Surplus funds originally dedicated for use in Iran for fiscal year 2012 were to be redirected and obligated for use in Benghazi: an action that had to be completed before the end of the fiscal year—September 30, 2012. Stevens had his last meeting of the day with a Turkish diplomat, and escorted the Turkish diplomat to the main gate at about 8:30 p.m. local time. The street outside the compound was calm, and the State Department reported no unusual activity during the day outside. Stevens retired to his room at about 9:00 p.m.
About 9:40 p.m. local time, large numbers of armed men shouting "Allāhu Akbar" (God is great) approached the compound from multiple directions. They then threw grenades over the wall and entered the compound with automatic weapons fire, RPGs, and heavier weapons. A Diplomatic Security Service (DSS) agent viewed on the consulate's security cameras "a large number of men, armed men, flowing into the compound". He hit the alarm and started shouting, "Attack! Attack!" over the loudspeaker. Phone calls were made to the embassy in Tripoli, the Diplomatic Security Command Center in Washington, the February 17th Martyrs Brigade and a U.S. quick reaction force located at the annex compound a little more than a mile (1.6 km) away. Diplomatic Security Service Special Agent Scott Strickland secured Stevens and Sean Smith, an information management officer, in the main building's safe haven. The rest of the agents left to retrieve their weapons and tried to return to the main building. The attackers entered the main building and attempted to enter the safe haven. They then spread diesel fuel in the room and set fires. Stevens, Smith, and Strickland moved to the nearby bathroom, but then decided to leave the safe haven after being overcome by smoke. Strickland exited through the window, but Stevens and Smith did not follow him. Strickland returned several times but could not find them in the smoke; he went up to the roof and radioed other agents. Three agents returned to the main building in an armored vehicle, searched the building and found Smith's body, but not Stevens. A U.S. Army commando unit was sent to Naval Air Station Sigonella in Sicily, Italy the night of the attack but did not deploy to Benghazi. U.S. officials say the team did not arrive at Sigonella until after the attack was over. Diplomatic Security Service agents/Regional Security Officers informed their headquarters in Washington about the attack just as it was beginning at about 9:40 p.m. local time (3:40 p.m. Eastern Time (ET)). At the time, they were informed that the attack was a "terrorist attack". However, through September 14, CIA analysts made a contradictory assessment, stating "We believe based on currently available information that the attacks in Benghazi were spontaneously inspired by the protests at the U.S. Embassy in Cairo and evolved into a direct assault against the U.S. Consulate and subsequently its annex. The crowd almost certainly was a mix of individuals from across many sectors of Libyan society. That being said, we do know that Islamic extremists with ties to al-Qa'ida participated in the attack." By 4:30 p.m. ET, Pentagon officials had informed Defense Secretary Leon Panetta about the attack. The Pentagon ordered an unmanned aerial vehicle that was in the air conducting surveillance on militant camps to fly over Benghazi. The drone arrived at 11:10 p.m. local time (5:10 p.m. ET) and began providing a video feed to Washington. At 5:41 p.m. ET, Secretary of State Hillary Clinton telephoned CIA Director David Petraeus to coordinate. The CIA, which made up most of the U.S. government's presence in Benghazi, had a ten-member security team at its annex and the State Department believed that this team would assist the consulate in the event of an attack. Just after midnight, the CIA annex came under machine gun, rocket and mortar fire. The CIA defenders held off the attack until the morning. :45–46 That same morning, Libyan government forces met up with a group of Americans, reinforcements from Tripoli including Glen Doherty, that had arrived at the Benghazi airport. The team, which included two active-duty JSOC operators and five CIA personnel, had commandeered a small jet in Tripoli by paying the pilots $30,000 and forcing them to fly to Benghazi. :43 After being held up at the airport for a few hours, the Libyan forces and newly arrived Americans went to the CIA annex at about 5:00 a.m. to assist in transporting approximately 32 Americans at the annex back to the airport for evacuation. Minutes after they drove through the gates, the annex came under heavy fire. With a lull in the fighting, Doherty began searching for his friend, Tyrone S. Woods, and he was told he was on the roof. He found Woods on the roof with two other agents. A mortar round then hit Woods' position, fatally wounding him. As Doherty attempted to reposition and take cover, a second round fell on him, killing him. :46–47 31-year-old Diplomatic Security Service Special Agent David Ubben suffered shrapnel injuries and several broken bones in the mortar attacks. At around 1:00 a.m., Stevens was taken to the Benghazi Medical Center, a hospital controlled by the Ansar Al-Sharia militia, in a private car as there was no ambulance to carry him. There he was administered CPR for 90 minutes by Dr. Ziad Abu Zeid. According to Dr. Zeid, Stevens died from asphyxiation caused by smoke inhalation, and had no other apparent injuries. The doctor said he believed that officers from the Libyan Interior Ministry transported the body to the airport. State Department officials said they do not know who took Stevens to the hospital or transported the body to the airport and into U.S. custody. The bodies were taken to Benina International Airport and flown to the capital, Tripoli, and then to Ramstein Air Base in Germany aboard a C-17 military transport aircraft. From Germany, the four bodies arrived at Andrews Air Force Base near Washington, D.C., where President Barack Obama and members of his cabinet held a ceremony in honor of those killed. After the attack, all diplomatic staff were moved to the capital, Tripoli, with nonessential personnel to be flown out of Libya. Sensitive documents remained missing, including documents listing the names of Libyans working with the Americans, and documents relating to oil contracts. Four Americans died in the attack: Ambassador J. Christopher Stevens, Information Officer Sean Smith, and two CIA operatives, Glen Doherty and Tyrone Woods, both former Navy SEALs. Stevens was the first United States ambassador killed in an attack since Adolph Dubs was killed in Kabul, Afghanistan in 1979. On September 10, 2012, at least 18 hours before the attack in Benghazi, al-Qaeda leader Ayman al-Zawahiri released a video to coincide with the anniversary of the 9/11 attacks in 2001, which called for attacks on Americans in Libya in order to avenge the death of Abu Yahya al-Libi in a drone strike in Pakistan in June 2012. It is uncertain how much prior knowledge of the attack al-Zawahiri had, though he praised the attackers on October 12, 2012 in another video. On September 14, 2012, al-Qaeda in the Arabian Peninsula released a statement arguing the attack was revenge for the death of al-Libi, though they did not claim official responsibility for the Benghazi attack. It was later reported that 3 operatives from the group did take part in the attack. Further, an intercepted phone call from the Benghazi area immediately after the attack reportedly linked senior Al-Qaeda in the Islamic Maghreb commander Mokhtar Belmokhtar to the attack. David Kirkpatrick of The New York Times reported that 20-year-old neighbor Mohamed Bishari witnessed the attack. According to Bishari, it was launched without warning or protest and was led by the Islamist militia Ansar al-Sharia (different from the group called Ansar al-Sharia based in Yemen designated by the U.N. and the U.S. Department of State as a terrorist organization). Kirkpatrick reported that Ansar al-Sharia said they were launching the assault in retaliation for the release of the anti-Islamic video, Innocence of Muslims. It was further reported that Ahmed Abu Khattala was called a ringleader of the attack by both witnesses and authorities, though he insisted he did not play a part in the aggression at the American compound. Witnesses, Benghazi residents, and Western news reports have described him as a leader of Ansar al-Sharia, though he stated he was close to the group but not an official part of it. He further stated he was the commander of an Islamist brigade, Abu Obaida ibn al-Jarrah, some of whose members had joined Ansar al-Sharia. The Brigades of the Imprisoned Sheikh Omar Abdul Rahman, a pro-al-Qaeda militia calling for the release of The Blind Sheik, was implicated in the attack by Noman Benotman of the Quilliam Foundation. CNN, the Carnegie Endowment for International Peace, Commentary Magazine and The Daily Telegraph have listed this group as a chief suspect. USA Today reported that protests in Cairo that preceded the attack on Benghazi were intended to protest the imprisonment of Sheik Omar Abdul Rahman and announced as early as August 30. Egyptian President Mohammed Morsi had called for release of the Blind Sheikh in his inaugural address. In the days and weeks following the attack, President Obama and other administration officials correctly noted that the video had sparked violent incidents at a number of U.S. diplomatic facilities, and Susan Rice stated — based on a flawed CIA assessment — the video was also a prime catalyst for the Benghazi attack. In a phone call with the Egyptian prime minister Kandil the day after the attack, then Secretary of State Hillary Clinton said "we know the attack in Libya had nothing to do with the film. It was a planned attack, not a protest." This assessment reflected information in an email sent by the State Department Operations Center to the White House, Pentagon, intelligence community and FBI at 6:07pm Eastern time the night of the attack, the subject line of which read, "Update 2: Ansar al-Sharia Claims Responsibility for Benghazi Attack." However, this assessment contradicted the assessment of CIA analysts, which through September 16 maintained that "the demonstrations in Benghazi were spontaneously inspired by the protests at the U.S. Embassy in Cairo," at which violent protesters had scaled the embassy walls. And the day after the attack, Ansar al-Sharia appeared to confirm both assessments when it issued a statement saying The [Ansar al-Shariah] Brigade didn't participate as a sole entity; rather, it was a spontaneous popular uprising in response to what happened by the West," which was an apparent reference to the Innocence of Muslims video. A later report from an independent review board concluded "there was no protest prior to the attacks." In a September 18 appearance on the Late Show with David Letterman, President Obama said, "extremists and terrorists used (the anti-Muslim YouTube video) as an excuse to attack a variety of our embassies." Obama spoke accurately, because five American embassies were the sites of violent protests due to the video, but Benghazi was not an embassy, it was a "diplomatic post." In his Univision Town Hall appearance on September 20, President Obama said that the "natural protests that arose because of the outrage over the video were used as an excuse by extremists to see if they can also directly harm U.S. interests." The Innocence of Muslims video triggered dozens of protests from northwest Africa to southeast Asia, including violent protests at American embassies in Tunis, Khartoum, Cairo, Sana and Jakarta. In October 2012, a Tunisian, Ali Harzi, who a U.S. intelligence official stated had links to Ansar al-Sharia and al-Qaeda in the Maghreb, was arrested in Turkey and repatriated to Tunisia on terrorism charges and possible links to the attack on the U.S. consulate in Benghazi. Ali Harzi was released by Tunisian authorities on January 8, 2013 because of a lack of evidence. Also in October, a Libyan suspect, Karim el-Azizi, who had recently returned to Egypt from Libya and was storing weapons in his hideout, detonated a bomb and was found dead in his apartment after clashes with security forces. He has been linked to an Egyptian terrorist group led by Muhammad Jamal Abu Ahmad, who is suspected of training some of the terrorists responsible for the Benghazi attack in camps in the Libyan desert. Jamal Abu Ahmad, a former member of Egyptian Islamic Jihad, was released from Egyptian prison after the fall of the Mubarak regime, after which he began assembling a terrorist network. He received financing from the Yemen-based Al-Qaeda in the Arabian Peninsula, petitioned Al-Qaeda leader Ayman al-Zawahiri to establish a new Al-Qaeda affiliate he called al-Qaeda in Egypt, and was subsequently detained by Egyptian authorities in December 2012. On October 7, 2013, the Muhammad Jamal network (MJN) and Muhammad Jamal were designated as "global terrorists" by the U.S. Department of State. The U.S. State Department noted in its designation that Jamal "has developed connections with al-Qa'ida in the Islamic Maghreb (AQIM), AQ senior leadership, and al-Qa'ida in the Arabian Peninsula (AQAP) leadership including Nasir 'Abd-al-Karim 'Abdullah al-Wahishi and Qasim Yahya Mahdi al-Rimi". A few days later, on October 21, 2013, the United Nations Security Council designated the MJN "as being associated with Al-Qaida". The United Nations Security Council also noted, "Some of the attackers of the U.S. Mission in Benghazi on September 11, 2012, have been identified as associates of Muhammad Jamal, and some of the Benghazi attackers reportedly trained at MJN camps in Libya." In March 2013, Faraj al-Shibli was detained by Libyan authorities and questioned by the FBI because of his suspected involvement in the Benghazi attack. Al-Shibli was detained after he returned from a trip to Pakistan, though his exact role in the attack is unclear. He was a member of the Libyan Islamic Fighting Group, which tried to overthrow the Gadhafi regime in the mid-1990s. Investigators have learned he has had contact with both the Yemen-based Al-Qaeda in the Arabian Peninsula and Al-Qaeda members in Pakistan. He was released by Libyan authorities on June 12, 2013, based on claims there was a lack of evidence to hold him in custody. In July 2014 he was found dead in Libya. Libyan Prime Minister Mustafa Abushagur's office condemned the attack and extended condolences, saying: "While strongly condemning any attempt to abuse the person of Muhammad, or an insult to our holy places and prejudice against the faith, we reject and strongly condemn the use of force to terrorize innocent people and the killing of innocent people." It also reaffirmed "the depth of relationship between the peoples of Libya and the U.S., which grew closer with the positions taken by the U.S. government in support of the revolution of February 17". Mohamed Yousef el-Magariaf, the President of the General National Congress of Libya, said: "We apologise to the United States, the people and to the whole world for what happened. We confirm that no-one will escape from punishment and questioning." 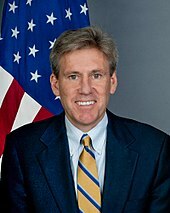 There were demonstrations in Benghazi and Tripoli on September 12, condemning the violence and holding signs such as "Chris Stevens was a friend to all Libyans", "Benghazi is against terrorism", and other signs apologizing to Americans for the actions in their name and in the name of Muslims. On the same day, Libya's Deputy Ambassador to London Ahmad Jibril told the BBC that Ansar Al-Sharia was behind the attack. On September 13, at a U.S. State Department reception in Washington D.C., the Libyan ambassador to the U.S. Ali Aujali apologized to Secretary of State Clinton for "this terrorist attack which took place against the American consulate in Libya". The ambassador further praised Stevens as a "dear friend" and a "real hero". He also urged the United States to continue supporting Libya as it went "through a very difficult time" and that the young Libyan government needed help so that it could "maintain ... security and stability in our country". In the days after the attack, The New York Times stated that young Libyans had flooded Twitter with pro-American messages after the attacks. Think Progress stated that Libyans are typically more positively inclined towards the United States than their neighbors. A 2012 Gallup poll noted that "A majority of Libyans (54%) surveyed in March and April 2012 approve of the leadership of the U.S.—among the highest approval Gallup has ever recorded in the ... region, outside of Israel." Another poll in Eastern Libya, taken in 2011, reported that the population was at the same time both deeply religious conservative Muslims and very pro-American, with 90% of respondents reporting favorable views of the United States. The Libyan response to the crisis was praised and appreciated in the United States, and President Obama emphasized how the Libyans "helped our diplomats to safety" to an American audience the following day, while a New York Times editorial criticized Egypt's government for not doing "what Libyan leaders did". On September 16, Libyan President Mohamed Magariaf said that the attack on the United States consulate was planned months in advance, and further stated that "[t]he idea that this criminal and cowardly act was a spontaneous protest that just spun out of control is completely unfounded and preposterous. We firmly believe that this was a precalculated, preplanned attack that was carried out specifically to attack the U.S. consulate." On September 21, about 30,000 Libyans marched through Benghazi calling for support of the rule of law and for an end to the armed militias that had formed during the Libyan Civil War to oppose Colonel Gaddafi. After that war, the militias failed to disband, and continually menaced the Libyan government and populace. Carrying signs with slogans such as "We Want Justice For Chris" and "Libya Lost a Friend", the protestors stormed several militia headquarters, including that of Ansar al-Sharia, an Islamist militia who some allege played a role in the attack on U.S. diplomatic personnel on September 11. At least 10 people were killed and dozens more wounded as militiamen fired on demonstrators at the headquarters of Sahaty Brigade, a pro-government militia "operating under the authority of the ministry of defence". By early next morning, the protestors had forced militia members to flee and seized control of a number of compounds, releasing four prisoners found inside. Protesters burnt a car and a building of at least one facility, and looted weapons. The militia compounds and many weapons were handed over to Libya's national army in what "appeared to be part of a coordinated sweep of militia bases by police, government troops and activists" following the earlier demonstrations. Some militia members accused the protestors of being Gaddafi loyalists, looking to disarm the militias in the wake of the revolution. On September 23, taking advantage of the growing momentum and rising anger against the militias evinced in the earlier anti-militia demonstrations, the Libyan president declared that all unauthorized militias had 48 hours to either disband or come under government control. The government also mandated that bearing arms in public was now illegal, as were armed checkpoints. Handling the militias had been difficult as the government had been forced to rely on some of them for protection and security. According to a Libyan interviewed in Tripoli, the government gained the ability to push back against the militias because of a "mandate of the people". On September 24, the government commenced with a raid on a former military base held by a rogue infantry militia. Across the country, militias began surrendering to the government. The government formed a "National Mobile Force" for the purpose of evicting illegal militias. On the same day as the declaration, various militias in Misrata held meetings, ultimately deciding to submit to the government's authority, and handed over various public facilities they had been holding, including the city's three main jails, which were handed over to the authority of the Ministry of Justice. Hours before the announcement, in Derna, the two main militias (one of them Ansar al-Sharia) active in the city both withdrew, leaving both their five military bases behind. Hundreds of Libyans, mainly former rebel fighters, gathered in the city centers of Tripoli and Benghazi to hand over their weapons to the government on September 29. The campaign has been less successful in other areas, such as the remote Nafusa Mountains, inhabited by the Nafusi-speaking Berber minority, where the Emirati news agency The National reported on September 23 that arms were being hoarded. The National also reported arms being hoarded in Misrata, despite simultaneous reporting by other outlets that militias were surrendering in Misrata. President Barack Obama, with Secretary of State Hillary Rodham Clinton, delivering a statement at the White House on September 12, 2012 in which he condemned the attack on the U.S. consulate. After the attack, Obama ordered that security be increased at all such facilities worldwide. A 50-member Marine FAST team was sent to Libya to "bolster security". It was announced that the FBI would investigate the possibility of the attack being planned. U.S. officials said surveillance over Libya would increase, including the use of unmanned drones, to "hunt for the attackers". Secretary of State Clinton also made a statement on September 12, describing the perpetrators as "heavily armed militants" and "a small and savage group—not the people or government of Libya". She also reaffirmed "America's commitment to religious tolerance" and said "Some have sought to justify this vicious behavior, along with the protest that took place at our Embassy in Cairo yesterday, as a response to inflammatory material posted on the Internet," but whether true or not, that was not a justification for violence. The State Department had previously identified embassy and personnel security as a major challenge in its budget and priorities report. On September 12, it was reported that the United States Navy dispatched two Arleigh Burke class destroyers, the USS McFaul and the USS Laboon, to the Libyan coast. The destroyers are equipped with Tomahawk cruise missiles. American UAVs were also sent to fly over Libya to search for the perpetrators of the attack. We enjoy our security and our liberty because of the sacrifices they make ... I want people around the world to hear me: To all those who would do us harm, no act of terror will go unpunished. It will not dim the light of the values that we proudly present to the rest of the world. There was no intelligence that in any way could have been acted on to prevent these attacks. It is—I mean, I think the DNI spokesman was very declarative about this that the report is false. The report suggested that there was intelligence that was available prior to this that led us to believe that this facility would be attacked, and that is false ... We have no information to suggest that it was a preplanned attack. The unrest we've seen around the region has been in reaction to a video that Muslims, many Muslims find offensive. And while the violence is reprehensible and unjustified, it is not a reaction to the 9/11 anniversary that we know of, or to U.S. policy. On September 14, the remains of the slain Americans were returned to the U.S.; President Obama and Secretary of State Hillary Clinton attended the ceremony. In her remarks Clinton said, "One young woman, her head covered and her eyes haunted with sadness, held up a handwritten sign that said 'Thugs and killers don't represent Benghazi nor Islam.' The President of the Palestinian Authority, who worked closely with Chris when he served in Jerusalem, sent me a letter remembering his energy and integrity, and deploring—and I quote—'an act of ugly terror.'" She went on to say: "We've seen the heavy assault on our post in Benghazi that took the lives of those brave men." Based on the best information we have to date, what our assessment is as of the present is in fact what began spontaneously in Benghazi as a reaction to what had transpired some hours earlier in Cairo where, of course, as you know, there was a violent protest outside of our embassy—sparked by this hateful video. But soon after that spontaneous protest began outside of our consulate in Benghazi, we believe that it looks like extremist elements, individuals, joined in that— in that effort with heavy weapons of the sort that are, unfortunately, readily now available in Libya post-revolution. And that it spun from there into something much, much more violent. We do not—we do not have information at present that leads us to conclude that this was premeditated or preplanned. I think it's clear that there were extremist elements that joined in and escalated the violence. Whether they were al Qaeda affiliates, whether they were Libyan-based extremists or al Qaeda itself I think is one of the things we'll have to determine. Since Rice's five television appearances, there have been persistent accusations that she had intentionally and repeatedly lied. However, none of the ten Benghazi investigations determined she had. For example, the Republican-controlled House Intelligence Committee "did not conclude that Rice or any other government official acted in bad faith or intentionally misled the American people," according to the Associated Press. In a White House press briefing on September 18, press secretary Jay Carney explained the attack to reporters: "I'm saying that based on information that we—our initial information, and that includes all information—we saw no evidence to back up claims by others that this was a preplanned or premeditated attack; that we saw evidence that it was sparked by the reaction to this video. And that is what we know thus far based on the evidence, concrete evidence." On September 20, White House Press Secretary Jay Carney answered a question about an open hearing with the National Counterterrorism Center Director, Matthew G. Olsen, which referenced which extremist groups might have been involved. Carney said, "It is, I think, self-evident that what happened in Benghazi was a terrorist attack. Our embassy was attacked violently, and the result was four deaths of American officials. So, again, that's self-evident." On the same day, during an appearance on Univision, a Spanish-language television network in the United States, President Obama stated, "What we do know is that the natural protests that arose because of the outrage over the video were used as an excuse by extremists to see if they can also directly harm U.S. interests." Also on September 20, Secretary of State Hillary Clinton gave a classified briefing to U.S. Senators, which several Republican attendees criticized. According to the article, senators were angered at the Obama administration's rebuff of their attempts to learn details of the Benghazi attack, only to see that information published the next day in The New York Times and The Wall Street Journal. On September 24, advertisements condemning an anti-Islam video appeared on Pakistani television. The television ads in Pakistan (marked with the U.S. Embassy seal) feature clips of President Obama and Secretary of State Clinton during press appearances in Washington in which they condemned the video. Their words were subtitled in Urdu. On September 25, in an address before the United Nations General Assembly President Obama stated, "The attacks on our civilians in Benghazi were attacks on America ... And there should be no doubt that we will be relentless in tracking down the killers and bringing them to justice." He referred to Innocence of Muslims as "a crude and disgusting video [that] sparked outrage throughout the Muslim world". He said, "I have made it clear that the United States government had nothing to do with this video, and I believe its message must be rejected by all who respect our common humanity." He further stated, "There is no video that justifies an attack on an Embassy." On September 26, Clinton acknowledged a possible link between Al-Qaeda in the Islamic Maghreb and the Benghazi attack. In the immediate aftermath, there was information that led us to assess that the attack began spontaneously following protests earlier that day at our embassy in Cairo. We provided that initial assessment to Executive Branch officials and members of Congress ... As we learned more about the attack, we revised our initial assessment to reflect new information indicating that it was a deliberate and organized terrorist attack carried out by extremists. It remains unclear if any group or person exercised overall command and control of the attack, and if extremist group leaders directed their members to participate. Also on September 28, it was reported that Nakoula Basseley Nakoula, the producer of the Innocence of Muslims video, had been arrested in California and was being held without bail for alleged probation violations stemming from a 2010 bank fraud conviction. On CNN's State of the Union with Candy Crowley on September 30, Crowley observed that "Friday we got the administration's sort of definitive statement that this now looks as though it was a pre-planned attack by a terrorist group, some of whom were at least sympathetic to al Qaeda," and asked the senior Republican on the Senate Armed Services Committee, Senator John McCain, "why do you think and are you bothered that it has taken them this long from September 11th to now to get to this conclusion?" to which McCain replied that "it interferes with the depiction that the administration is trying to convey that al Qaeda is on the wane ... how else could you trot out our U.N. ambassador to say this was a spontaneous demonstration? ... It was either willful ignorance or abysmal intelligence to think that people come to spontaneous demonstrations with heavy weapons, mortars, and the attack goes on for hours." On October 4, 22 days after the attack, FBI investigators were finally allowed access to the scene of the attack. The crime scene was not secured during that time; neither American nor Libyan investigators were able to secure the scene. The hearing testimony revealed that "Hicks argued that Rice's comments so insulted the Libyan president—since they contradicted his Sept. 16 claims that the attack was premeditated—that it slowed the FBI's investigation. 'President Magariaf was insulted in front of his own people, in front of the world. His credibility was reduced,' Hicks said, adding that the president was apparently 'still steamed' two weeks later." To assist the Libyan government in disbanding extremist groups, the Obama administration allocated $8 million to begin building an elite Libyan commando force over the next year. In the Presidential debate of October 16, 2012, between President Obama and Mitt Romney, Romney claimed that "it took the president 14 days before he called the attack in Benghazi an act of terror." President Obama responded, "The day after the attack, governor, I stood in the Rose Garden and I told the American people and the world that we are going to find out exactly what happened," Obama said. "That this was an act of terror, and I also said that we're going to hunt down those who committed this crime." When Romney challenged Obama, asking "You said in the Rose Garden the day after the attack, it was an act of terror. It was not a spontaneous demonstration, is that what you're saying?" the President responded, "Please proceed, governor" and "Get the transcript." The moderator of the debate, Candy Crowley, agreed, stating "He—he did call it an act of terror." A CNN analysis stated that Obama had indeed referred to the incident as a "terrorist attack", but that Romney was correct in noting that the administration delayed in conclusively stating that the attack was not a spontaneous protest related to the video. A May 14, 2013 Fact Checker by Glenn Kesler said that Obama repeatedly used the phrase "act of terror" when talking about the attack, but he did not directly state that the attack was an act of terror. On October 19, 2012, House Oversight Committee Chairman Darrell Issa (R-CA) came under fire from intelligence officials in the Obama administration when he posted, on a public website, 166 pages of sensitive but unclassified State Department communications related to Libya. According to officials, the release of the unredacted documents compromised the identities of several Libyans working with the U.S. government and placed their lives in danger. On CBS's Face the Nation on October 28, Senator John McCain (R-AZ) stated that "this is either a massive cover-up or incompetence" and suggested that it was a scandal worse than Watergate. McCain stated, "we know that there were tapes, recordings inside the consulate during this fight ... So the president went on various shows, despite what he said in the Rose Garden, about terrorist acts, he went on several programs, including The View, including Letterman, including before the UN where he continued to refer, days later, many days later, to this as a spontaneous demonstration because of a hateful video. We know that is patently false. What did the president know? When did he know it? And what did he do about it?" CBS News reported earlier on October 24 that the video of the assault was recovered 20 days after the attack, from the more than 10 security cameras at the compound. In a radio interview October 29, 2012, Senator John McCain said that the surveillance tapes had been classified top secret. Secretary Clinton was scheduled to testify before Congress on December 20 about the attack. On December 15, it was reported that she had become dehydrated from the flu, fainted, and sustained a concussion. Consequently, her testimony was postponed. The incident prompted Republican Rep. Allen West to claim that the illness was a ruse intended to avoid testifying. Former UN Ambassador John Bolton called the concussion a "diplomatic illness". With all due respect, the fact is, we had four dead Americans! Was it because of a protest or was it because of guys out for a walk one night and decided they'd go kill some Americans?! What difference, at this point, does it make?! It is our job to figure out what happened and do everything we can to prevent it from ever happening again, Senator. Now, honestly, I will do my best to answer your questions about this, but the fact is that people were trying in real time to get to the best information. The [Intelligence Community] has a process, I understand, going with the other committees to explain how these talking points came out. But you know, to be clear, it is, from my perspective, less important today looking backwards as to why these militants decided they did it than to find them and bring them to justice, and then maybe we'll figure out what was going on in the meantime. In March 2013, Representative Duncan D. Hunter introduced legislation into the 113th Congress to authorize awarding of Congressional Gold Medals to Doherty and Woods for their actions that led to their deaths. In April 2013, the Pentagon announced the activation of a USMC quick response force for North Africa that would use the range and speed of the Bell Boeing V-22 Osprey to be able to respond to similar events in the future. Spain authorized the basing of the quick response force at Morón Air Base near Seville, for a temporary one-year term. On May 13, 2013, President Obama stated during a news conference, "The day after it happened, I acknowledged that this was an act of terrorism." This claim was disputed by Glenn Kessler of The Washington Post in a "Fact Checker" article, which explored at length the difference in meaning between the phrases "act of terror" and "act of terrorism." In the article, Kessler accused Obama of "revisionist history" for stating he had called the attack an "act of terrorism" when in fact he had used the term "act of terror", observing that Obama had gone out of his way to avoid calling the incident an "act of terrorism" or blame the ambassador's death on terrorism. This bill advances efforts to improve the physical infrastructure at posts overseas to comply with the highest standards of protection; to increase training for those responsible for guarding our compounds and personnel; to put in place procedures that respond appropriately to threats, reducing the chances of another attack like that suffered in Benghazi, Libya; to review the policies and procedures of the Bureau of Diplomatic Security; to authorize the use of best value contracting at high risk, high threat posts; to authorize security improvements at soft targets; and to provide for security enhancements in line with Accountability Review Board recommendations. Critics including Republican Party members accused the Obama White House and State Department of over-emphasizing or fabricating the role of Islamic anger over the anti-Islamic movie Innocence of Muslims and alleged that the administration was reluctant to label the attack as "terrorist". Representative Mike Rogers (R-MI), chairman of the House Intelligence Committee, who on September 13 said that the attacks had all the hallmarks of a coordinated attack by al-Qaeda, has questioned whether there were any protests at all in Benghazi, saying: "I have seen no information that shows that there was a protest going on as you have seen around any other embassy at the time. It was clearly designed to be an attack." According to critics, the consulate site should have been secured better both before and after the attack. GOP legislators also took issue with delays in the investigation, which CNN attributed to "bureaucratic infighting" between the FBI, Justice, and State. On September 26, Senator Johnny Isakson (R-Georgia) said he "cannot believe that the FBI is not on the ground yet". Testimony from top U.S. commanders after the attack revealed that the military was unprepared for conflict across Africa and the Middle East. No attack aircraft had been placed on high alert on September 11, the anniversary of the September 11 attacks in 2001, and the closest fighter planes to trouble spots in North Africa were based in Aviano, Italy. The fighter planes based in Aviano were unarmed and no aerial refueling planes were within a 10-hour flight to the base. In addition, no AC-130 gunships were within a 10-hour flight of Libya, and their crews did not reach a staging base in Italy until 19 hours after the attack began. With the attack and subsequent criticism occurring in the last two months of the 2012 U.S. Presidential election, Democrats and liberal media figures accused Republicans of politicizing the attacks in an unprecedented manner. Romney was accused by the Obama campaign of trying to exploit the attacks for political gain, leading the father of Ambassador Stevens to call for both campaigns to avoid making it a campaign issue. Robert Gates, former CIA director and Defense Secretary under Republican Presidents and then President Obama until stepping down in July 2011, has said that some critics of the government's response have a "cartoonish" view of military capabilities. He stated that he would have responded with equal caution given the risks and the lack of intelligence on the ground, and that American forces require planning and preparation, which the circumstances did not allow for. President Obama called the criticism a "sideshow" and later accused Congress of "taking its eye off the ball" on the subject of the economy and focusing on "phony scandals". White House Spokesman Jay Carney later specified that the criticism of the administration's handling of the Benghazi attacks was one of those "phony scandals". On December 10, 2014, upon publication of the House Permanent Select Committee on Intelligence report on Benghazi, Committee Chairman Mike Rogers wrote in an op-ed piece, "The Obama administration's White House and State Department actions before, during, and after the Benghazi terrorist attack on September 11, 2012, ranged from incompetence to deplorable political manipulation in the midst of an election season." However, immediately upon release of the Committee's report on November 21, 2014, the Associated Press reported that the Committee did not conclude that any "government official acted in bad faith or intentionally misled the American people." For actions in Benghazi during the attack, a Marine was awarded the Navy Cross, and a Soldier was awarded the Distinguished Service Cross; their names have been held in secret. Multiple conservative media outlets, most notably Fox News, promulgated an elaborate narrative of a scandal and cover-up by officials of the Obama administration, including, among other things, accusations that officials issued a "stand-down order" to preclude a military rescue operation; that officials knowingly lied by repeatedly asserting the attack was spontaneously triggered by the Innocence of Muslims video rather than a pre-planned terrorist attack; that a secret CIA gun-running operation to Syrian rebels was being conducted out of Libya; that President Obama and Hillary Clinton were absent and negligent on the night of the attack; that Hillary Clinton had personally declined multiple requests for more security at the compound; that a live video feed of the attack was viewed at the White House or State Department; that Ambassador Stevens had been captured by terrorists and dragged through the streets; and that witnesses had been prevented from testifying. These accusations were widely shared across various blogs and social media platforms. Ultimately, none of the accusations of scandal and cover-up were confirmed by any of the ten Benghazi investigations, including six investigations conducted by Republican-controlled congressional committees. The Center for Media and Public Affairs at George Mason University described the conclusions of an unpublished study on November 2, 2012. Based on a textual analysis that tallied the occurrence of certain words and phrases in news reports during the days immediately following the attack, the study concluded that leading newspapers in the U.S. framed the attack in terms of a spontaneous protest over the anti-Islamic film Innocence of Muslims as framed by the Obama administration's version, four times as often as a planned terrorist attack, which was the Republican version. However, the 2014 final report by the Republican-controlled House Intelligence Committee found that during the days immediately following the attack there was confusion among intelligence analysts as to the origin of the attack, leading to an initial assessment that it was the spontaneous outcome from a protest. Obama administration officials, most notably Susan Rice, were provided this early assessment and repeated it to media outlets, only to be later contradicted as further intelligence assessments were made. None of the ten investigations into Benghazi found that any senior Obama administration officials had acted improperly. An organized attack. Anybody who tells you that what happened to our ambassador and our consulate in Libya was as a result of a protest over an offensive movie, you should ask them why they think that. That's the first version of events we heard. That does not seem to explain what happened that night or by the facts or the more facts we get. On June 2014, Maddow criticized the right-wing media for reporting an arrest as bad news, said that Americas are poorly served by the media, and that "the take on Fox News is that's not actually news" and now "they have to make it bad news, they have to make into maybe a scandal itself." On the edition of October 24 of Fox News' Special Report with Bret Baier, syndicated columnist Charles Krauthammer claimed that a State Department e-mail, which passed along a report from Embassy Tripoli that Ansar al-Sharia had claimed responsibility for the attack on Facebook and Twitter, proved that the White House knew of terrorist connections to the attack almost immediately. Krauthammer stated, "This is really a journalistic scandal. I mean, the fact there was not a word about any of this in the [New York] Times or the [Washington] Post today." However, the day after the Benghazi attack, Ansar al-Sharia issued a statement saying that the attack was in part "a spontaneous popular uprising in response to what happened by the West," which was an apparent reference to the Innocence of Muslims video. Conservative pundit Jonah Goldberg of the National Review stated that on NBC's Meet the Press, host David Gregory changed the subject when a guest raised the subject of the Benghazi attack, saying, "Let's get to Libya a little bit later", but never returned to the subject. On November 26, 2012, journalist Tom Ricks went on Fox News' Happening Now with Jon Scott to discuss the attack. While being interviewed on Fox News by Jon Scott, Ricks accused Fox News of being "extremely political" in its coverage of the attack and said that "Fox was operating as a wing of the Republican Party." Ricks accused the network of covering the story more than it needed to be. The interview was cut short and Ricks and the interview was not mentioned or covered by Fox News again. Fox News was subsequently criticized for cutting the interview short. In an interview with the Associated Press, Fox News' White House correspondent Ed Henry suggested that he thought Benghazi was being covered too much by the network. Henry said, "We've had the proper emphasis, but I would not be so deluded to say that some of our shows, some of our commentators, have covered it more than it needed to be covered." There were ten investigations into the Benghazi matter: one by the FBI; one by an independent board commissioned by the State Department; two by Democrat-controlled Senate Committees; and six by Republican-controlled House Committees. After the first five Republican investigations found no evidence of wrongdoing by senior Obama administration officials, Republicans in 2014 opened a sixth investigation, the House Select Committee on Benghazi, chaired by Trey Gowdy. This investigation also failed to find any evidence of wrongdoing by senior Obama administration officials. A possible political motive for the investigation was revealed on September 29, 2015, when Republican House majority leader Kevin McCarthy, then vying to become Speaker of the House, told Sean Hannity on Fox News that the investigation was part of a "strategy to fight and win,' adding "Everybody thought Hillary Clinton was unbeatable, right? But we put together a Benghazi special committee, a select committee. What are her numbers today? Her numbers are dropping." Shortly after the Benghazi attack, Secretary of State Clinton commissioned an independent Accountability Review Board to investigate, chaired by retired ambassador Thomas R. Pickering with vice-chair retired Chairman of the Joint Chiefs of Staff Michael Mullen. The Board released their final report on December 19, 2012. It made 29 recommendations to the State Department on how to improve its operations, which Clinton pledged to implement. As part of this investigation, four career State Department officials were criticized for denying requests for additional security at the facility prior to the attack. By the end of 2012, Eric J. Boswell, the Assistant Secretary of State for Diplomatic Security, resigned under pressure, while three others were suspended. None of the other Benghazi investigations identified wrongdoing by any individuals. The House Select Committee on Benghazi's final report was released on June 28, 2016 and the committee closed down five months later. It criticized the actions and speed of response of the State Department, and the Defense Department, leading up to and during the attacks in Benghazi. No further public investigations have been conducted since. Freedom of Information Act requests have been made since the attack. The conservative foundation Judicial Watch filed a FOIA request to the Department of State on December 19, 2012. An acknowledgement of the request was received by Judicial Watch on January 4, 2013. When the State Department failed to respond to the request by February 4, 2013, Judicial Watch filed a lawsuit, which resulted in seven photographs being delivered on June 6, 2013. Three of the photographs show Arabic-language spray paint graffiti. According to preliminary translations provided to the U.K. MailOnline by the Investigative Project on Terrorism, the graffiti likely reads "Thrones of HamzaIn"; "Allah-u Akbar" ("God is Great"); and "Unity of ranks". On May 30, 2013 it was reported that the Republican National Committee filed a FOIA for "any and all emails or other documents containing the terms 'Libya' and/or 'Benghazi' dated between September 11, 2012 and November 7, 2012 directed from or to U.S. Department of State employees originating from, or addressed to, persons whose email addresses end in either 'barackobama.com' or 'dnc.org'". On April 18, 2014, the conservative group Judicial Watch released more than 100 pages of documents obtained through a FOIA lawsuit. One email, dated September 14, 2012, with a subject line "RE PREP CALL with Susan: Saturday at 4:00 pm ET", was from deputy national security advisor for strategic communications Rhodes stated: "Goals: ... To underscore that these protests are rooted in an Internet video, and not a broader failure of policy..." According to another e-mail obtained by Judicial Watch, when asked about whether the attack was linked to the Mohammad video, State Department spokesperson Victoria Nuland said she "could not confirm a connect as we simply don't know—and we won't know until there is an investigation". According to The Wall Street Journal, the e-mail was written to prepare U.S. Ambassador to the U.N. Susan Rice for her appearances on Sunday news shows two days later, and it "sets out the Administration's view of the cause of the Benghazi attacks". John Dickerson of Slate says the e-mail refers to the worldwide protests to Innocence of Muslims and not the Benghazi attack. ^ a b c Robertson, Nic; Cruickshank, Paul; Lister, Tim (September 13, 2012). "Pro-al Qaeda group seen behind deadly Benghazi attack". CNN. Retrieved December 30, 2012. ^ "Libyan storm Ansar Al-Sharia compound in backlash after attack on U.S. Consulate". Fox News Channel. Associated Press. September 21, 2012. ^ Suzanne Kelly; Pam Benson; Elise Labott (October 24, 2012). "U.S. Intel believes some Benghazi attackers tied to al Qaeda in Iraq". CNN. ^ a b c d Paul Cruickshank, Tim Lister, Nic Robertson, and Fran Townsend, "Sources: 3 al Qaeda operatives took part in Benghazi attack" CNN, May 4, 2013. ^ "U.S. Senate Select Committee Review of the Terrorist Attacks on U.S. 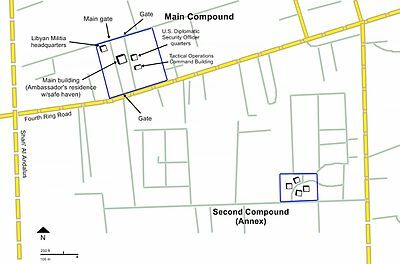 Diplomatic Facilities in Benghazi, Libya, September 11–12, 2012" (PDF). January 15, 2014. Archived from the original (PDF) on January 16, 2014. ^ a b "Timeline: Here's how the Benghazi attacks played out". Washington Post. Retrieved September 28, 2016. ^ "Christopher Stevens first American ambassador to be slain on duty since 1979". The Boston Globe. September 13, 2013. ^ "US officials: CIA ran Benghazi consulate". United Press International. November 2, 2012. ^ Aaron Blake (January 27, 2014). "Clinton says Benghazi is her biggest regret". The Washington Post. ^ Dilanian, Ken. "House intel panel debunks many Benghazi theories". AP NEWS. Herridge, Cathrine (December 4, 2013). "CIA witnesses offer more evidence Benghazi attack planned". Fox News Channel. Retrieved November 11, 2014. Starr, Barbara (September 27, 2012). "Panetta: Terrorists 'clearly' planned Benghazi attack". CNN. Retrieved November 7, 2015. ^ David D. Kirkpatrick (June 17, 2014). "Brazen Figure May Hold Key to Mysteries". The New York Times. Retrieved June 21, 2014. David D. Kirkpatrick (October 18, 2012). "Suspect in Libya Attack, in Plain Sight, Scoffs at U.S." The New York Times. Retrieved June 21, 2014. ^ "Exclusive:Libyan Islamist says he was at U.S. consulate during attack". Reuters. October 18, 2012. Retrieved October 2, 2016. ^ May, Clifford D. (November 8, 2012). "Lessons of the Battle of Benghazi". National Review Online. Retrieved November 11, 2012. Now that the election is behind us, perhaps we can put politics aside and acknowledge a hard fact: On September 11, 2012, America was defeated by al-Qaeda in the Battle of Benghazi. Ackerman, Spencer (November 12, 2012). "What Happened in Benghazi Was a Battle". Wired. Retrieved November 11, 2012. Which means the next battle of Benghazi could be even more intense than the last. Shaffer, Tony (October 30, 2012). "To live and die in Benghazi, Libya without leadership from America". Fox News Channel. Retrieved November 11, 2012. This battle of Benghazi was a protracted fight—covering at least six to eight hours (depending on when you start the clock). Mitchell Zuckoff (September 9, 2014). 13 Hours: The Inside Account of What Really Happened In Benghazi. Grand Central Publishing. p. 226. ISBN 978-1-4555-8229-7. When the Libyan C-130 took flight bearing the last operators and the four bodies, the Battle of Benghazi ended as a combat engagement between Americans and their enemies. May, Clifford D. (November 8, 2012). "Lessons of the Battle of Benghazi". National Review. National Review Institute. Retrieved March 31, 2015. On September 11, 2012, America was defeated by al-Qaeda in the Battle of Benghazi. ^ "N.Y. Times probe finds no al-Qaeda link to Benghazi raid". USATODAY. December 28, 2013. ^ "New York Times report casts doubt on al Qaeda involvement in Benghazi". cnn.com. December 30, 2013. ^ "In Benghazi, US Intelligence Wasn't Focused On 'Homegrown Militants'". npr.com. February 26, 2014. "Transcript: In Benghazi, US Intelligence Wasn't Focused On 'Homegrown Militants'". npr.com. February 26, 2014. ^ a b "US won't rule out Islamist militant link to attack on US consulate in Libya". NBC News. September 12, 2012. Retrieved September 12, 2012. ^ "CIA talking points for Susan Rice called Benghazi attack 'spontaneously inspired' by protests". CBS News. November 15, 2012. ^ a b Cooper, Helene (September 14, 2012). "Egypt May Be Bigger Concern Than Libya for White House". The New York Times. ^ a b c d "Libya: Islamist militia bases stormed in Benghazi". BBC News. September 22, 2012. Retrieved September 22, 2012. ^ a b c d e f "Angry Libyans Target Militias, Forcing Flight". The New York Times. September 22, 2012. Retrieved September 22, 2012. ^ Schmidt, Michael S. (November 22, 2014). "G.O.P.-Led Benghazi Panel Bolsters Administration" – via NYTimes.com. ^ O’Toole, Molly. "Libya Is Obama's Biggest Regret — And Hillary's Biggest Threat". ^ O’Toole, Molly. "In Final Report, Benghazi Committee Finds No New Evidence of Clinton Wrongdoing". ^ Gearan, Anne; Miller, Greg (December 19, 2012). "Four State Dept. officials disciplined after Benghazi probe". Retrieved April 1, 2018 – via www.washingtonpost.com. ^ "Transcript of Hillary Clinton's testimony on Benghazi attack". New York Daily News. ^ Perez, Evan (August 7, 2013). "First criminal charges filed in Benghazi attack probe". CNN. Retrieved September 5, 2013. ^ "Terrorist Designations of Three Ansar al-Shari'a Organizations and Leaders". U.S. Department of State. January 10, 2014. Retrieved June 19, 2014. ^ John King; Chelsea J. Carter (August 7, 2013). "Lawmaker: If CNN can interview suspect in Benghazi attack, why can't FBI?". CNN. Retrieved May 8, 2014. ^ Erik Wemple (April 3, 2014). "New York Times stands by Benghazi story". The Washington Post. Retrieved May 8, 2014. ^ "U.S. captures Benghazi suspect in secret raid". The Washington Post. ^ "Man seized over Benghazi attack is Syrian linked to suspected ringleader -Libyan officials". Reuters. ^ a b c Schmitt, Eric; Cooper, Helene; Schmidt, Michael S. "Deadly Attack in Libya Was Major Blow to CIA Efforts" The New York Times, September 23, 2012. ^ a b c d e f g h i j k l Murphy, Jack and Brandon Webb (2013). Benghazi: The Definitive report. New York, NY: HarperCollins Inc. pp. 25–58. ISBN 978-0-06-227691-9. ^ Cox, Carmen. "U.S. Names Chris Stevens Liaison to Libyan Opposition" ABC News, March 14, 2011. ^ Ross, Brian; Cole, Matthew. "Nightmare in Libya: Thousands of Surface-to-Air Missiles Unaccounted For" ABC News, September 27, 2011. ^ Coughlin, Con. "Will a Middle East awash with weapons be Gaddafi's final legacy?" The Telegraph, October 23, 2011. ^ a b Griffin, Drew; Johnston, Kathleen. "Exclusive: Dozens of CIA operatives on the ground during Benghazi attack" CNN, August 1, 2013. ^ Murphy, Jack. "America's Assassination Program in Libya" SOFREP, August 5, 2013. ^ Herridge, Catherine; Browne, Pamela. "Was Syrian weapons shipment factor in ambassador’s Benghazi visit?" Fox News Channel, October 25, 2012. ^ McElroy, Damien. "CIA 'running arms smuggling team in Benghazi when consulate was attacked'" The Telegraph, August 2, 2013. ^ Seymour Hersh (April 17, 2014). "The Red Line and the Rat Line". London Review of Books. ^ "HPSCI January 2014 Update on Benghazi" (PDF). intelligence.house.gov. House Permanent Select Committee on Intelligence. 2014. Retrieved November 5, 2016. ^ a b c Tom McCarthy. "Benghazi under scrutiny at congressional hearing – live blog". The Guardian. ^ a b c "Benghazi witness points finger at Clinton on lapses in consulate security". The Hill. ^ a b "Clinton's role in the Benghazi fiasco and blame-shifting". The Washington Post. ^ a b c Benghazi: Exposing Failure and Recognizing Courage: Hearing Before the Committee on Oversight and Government Reform: House of Representatives One Hundred Thirteenth Congress First Session May 8, 2013 (PDF). 2013. pp. 40–1 & 89. ^ a b c "Part I @ 1:59 & Part III @ 33:25". Benghazi: Exposing Failure and Recognizing Courage. 2013. ^ "The latest on Benghazi hearing". CNN. ^ Dan Roberts. "U.S. officials blocked rescue efforts while Benghazi burned, Congress told". The Guardian. ^ Lake, Eli (October 2, 2012). "U.S. Consulate in Benghazi Bombed Twice in Run-up to 9/11 Anniversary". The Daily Beast. Retrieved October 2, 2012. ^ "U.S. embassy Tripoli Libya Security Incidents Since June 2011 hosted by ABC News" (PDF). Retrieved May 14, 2013. ^ "ICRC pulls out of parts of Libya". United Press International. August 6, 2012. Retrieved October 21, 2012. ^ Stephen, Chris (June 6, 2012). "US diplomatic mission bombed in Libya". The Guardian. London. Retrieved September 12, 2012. ^ "US consulate in Libya bombed – video". The Guardian. London. June 6, 2012. Retrieved September 12, 2012. ^ Issa, Darrell; Chaffetz, Jason (October 2, 2012). "Letter to Hillary Clinton" (PDF). House of Representatives Committee on Oversight and Government Reform. Retrieved October 7, 2012. ^ Robertson, Nic; Cruickshank, Paul; Lister, Tim (September 13, 2012). "Pro-al Qaeda group seen behind deadly Benghazi attack". CNN. Retrieved September 13, 2012. ^ Karadsheh, Jomana; Robertson, Nic (June 6, 2012). "U.S. mission in Benghazi attacked to avenge al Qaeda". CNN. ^ "British ambassador to Libya escapes uninjured after his convoy is hit by rocket-propelled grenade". Daily Mail. London. June 11, 2012. ^ "British Guns Accounted For After Benghazi Consulate Attack". The Tripoli Post. October 12, 2012. Archived from the original on November 18, 2012. ^ "Middle East and North Africa, Libya". Foreign and Commonwealth Office of the UK. Retrieved October 21, 2012. ^ Duell, Mark (October 11, 2012). "Missing British guns from US consulate in Libya 'could have been seized by extremists' one month after site was destroyed". Daily Mail. London. ^ "More details emerge on U.S. ambassador's last moments". CNN. September 11, 2012. ^ "U.S. officer got no reply to requests for more security in Benghazi". Reuters. October 9, 2012. ^ "Flashing Red: A Special Report On The Terrorist Attack At Benghazi" (PDF). United States Senate Committee On Homeland Security And Governmental Affairs. December 30, 2012. ^ Taylor, Scott (2015). Trust Betrayed: Barack Obama, Hillary Clinton, and the Selling Out of America's National Security. Regnery Publishing. ISBN 978-1-62157-327-2. ^ "Secretary of State Hillary Clinton takes "responsibility" for Benghazi attack". CBS News. October 18, 2012. ^ "The Kelly File". Fox News Channel. August 1, 2014. ^ Edward M. Brittingham (October 24, 2014). Beyond O'Dark 30. Dorrance Publishing. p. 39. ISBN 978-1-4809-6192-0. ^ "Benghazi timeline: How the attack unfolded". CBS News. May 13, 2013. Retrieved October 26, 2015. ^ a b Youssef, Nancy A.; Zway, Suliman Ali (September 13, 2012). "No protest before Benghazi attack, wounded Libyan guard says". ^ a b "President Obama's Address at 67th U.N. General Assembly". International Information Programs, U.S. Embassy. September 25, 2012. Retrieved October 25, 2012. ^ a b "Background Briefing on Libya". U.S. Department of State. October 9, 2012. Archived from the original on May 8, 2017. Retrieved October 30, 2012. ^ a b McLean, Alan; Peçanha, Sergio; Tse, Archie; Waananen, Lisa (October 1, 2012). "The Attack on the American Mission in Benghazi, Libya". The New York Times. Retrieved October 28, 2012. ^ Youssef, Nancy A.; Zway, Suliman Ali; Landay, Jonathan S. (September 12, 2012). "Islamists targeted U.S. diplomats with gunfire, RPGs in planned assault, witness says". ^ Schemm, Paul; Michael, Maggie (October 27, 2012). "Libyan witnesses recount organized Benghazi attack". Associated Press. Archived from the original on October 30, 2012. Retrieved October 27, 2012. ^ a b c Dettmer, Jamie; Dickey, Christopher; Lake, Eli (October 21, 2012). "The Truth Behind the Benghazi Attack". The Daily Beast. Retrieved October 29, 2012. ^ Klapper, Bradley (October 27, 2012). "Timeline of comments on attack on US Consulate". Associated Press. Retrieved October 27, 2012. ^ a b c d "DEPUTY ASSISTANT SECRETARY OF STATE CHARLENE LAMB TESTIMONY BEFORE HOUSE OVERSIGHT COMMITTEE WASHINGTON, DC WEDNESDAY, OCTOBER 10, 2012" (PDF). Committee on Oversight & Government Reform. October 10, 2012. Retrieved October 19, 2012. ^ a b c d "Timeline: How Benghazi attack, probe unfolded". CBS News. November 2, 2012. Retrieved November 4, 2012. ^ "Top CIA officer in Benghazi delayed response to terrorist attack, U.S. security team members claim". Fox News Channel. September 6, 2014. Retrieved September 7, 2014. Kirkpatrick, David (September 4, 2014). "New Book Says CIA Official in Benghazi Held Up Rescue". The New York Times. Retrieved September 7, 2014. Szoldra, Paul (September 4, 2014). "New Book Claims Top CIA Officer In Benghazi Told Commandos To 'Stand Down' During Attack". Business Insider. Retrieved September 7, 2014. Baier, Bret (September 5, 2014). "Benghazi Bombshell: Security Team Told to 'Stand Down' By CIA Officer". Fox News Insider. Retrieved September 10, 2014. Zuckoff, Mitchell; Annex Security Team (five members) (September 9, 2014). 13 Hours: The Inside Account of What Really Happened In Benghazi. Hachette Book Group USA. ISBN 9781455582273. ^ Jessica Chasmar, "Benghazi hero David Ubben still recovering at Walter Reed" The Washington Times, July 25, 2013. ^ David Martin, "U.S. military poised for rescue in Benghazi" CBS News October 24, 2012. ^ Staff (October 7, 2014). "Panetta: 'From The Beginning' I Knew Benghazi Was A Terrorist Attack". Washington Free Beacon. Retrieved November 5, 2014. James Rosen (January 14, 2014). "The Benghazi Transcripts: Top Defense officials briefed Obama on 'attack,' not video or protest". Fox News Channel. Retrieved November 5, 2014. Leslie Larson (January 14, 2014). "Pentagon labeled Benghazi a terrorist attack as Obama administration wavered: newly declassified testimony". Daily News. New York. Retrieved November 5, 2014. ^ Bump, Philip. "The Benghazi Memo Drafts, as They Evolved". Retrieved April 2, 2018. ^ Entous, Adam; Gorman, Siobhan; Coker, Margaret (November 1, 2012). "CIA Takes Heat for Role in Libya". The Wall Street Journal. Retrieved May 13, 2013. ^ Wemple, Erik (November 16, 2012). "Fox News mangled huge Benghazi story". The Washington Post blog. ^ Griffin, Jennifer (July 26, 2013). "Who was Glen Doherty? Details emerge on former SEAL's final actions in Benghazi". Fox News Channel. ^ a b Al-Khalidi, Suleiman (September 17, 2012). "Video shows Libyans helping rescue U.S. ambassador after attack". Reuters. Retrieved September 27, 2012. ^ a b "Libya witness: Stevens was alive when found". CBS News. October 18, 2012. ^ "Video shows Libyans trying to rescue U.S. ambassador". Yahoo News. September 17, 2012. ^ "Travel Warning – Libya". U.S. Embassy in Tripoli, Libya. September 12, 2012. Archived from the original on February 14, 2013. Retrieved May 13, 2013. ^ "President Obama on the Attack in Benghazi". International Information Programs, U.S. Embassy. September 12, 2012. Retrieved October 3, 2012. ^ Parkinson, John. "Diplomat: Ambassador in Benghazi Said, 'We're Under Attack'" ABC News, May 8, 2013. ^ Michael, Maggie (September 17, 2012). "Video shows Libyans trying to save U.S. ambassador". Associated Press. Retrieved May 22, 2013. ^ "US ambassador killed in Libya attack: Chris Stevens 'given CPR for 90 minutes', says Benghazi doctor". The Daily Telegraph. London. September 13, 2012. ^ a b Baker, Peter; Kirkpatrick, David D. (September 14, 2012). "Diplomats' Bodies Return to U.S., and Libyan Guards Recount Deadly Riot". The New York Times. Retrieved November 4, 2012. ^ "Benghazi timeline: How the attack unfolded". CBS News. November 2, 2012. ^ Sengupta, Kim (September 14, 2012). "Revealed: inside story of US envoy's assassination". The Independent. London. ^ Blake, Aaron (January 27, 2014). "Clinton says Benghazi is her biggest regret". The Washington Post. ^ Hillary Rodham Clinton, Secretary of State. "Statement on the Deaths of Tyrone S. Woods and Glen A. Doherty in Benghazi, Libya (September 13, 2012)". U.S. Department of State. Archived from the original on September 20, 2012. Retrieved September 20, 2012. "Clinton Recognizes Victims of Benghazi Attacks". State Department's Bureau of International Information Programs (IIP). September 14, 2012. Retrieved October 15, 2012. ^ "Former Navy SEALs identified as consulate attack victims". Fox News Channel. September 14, 2012. Retrieved September 13, 2012. ^ Baker, Debbi (September 13, 2012). "Two ex-SEALs from SD killed in Libya". San Diego Union Tribune. ^ Paul Cruickshank, "Analysts search for clues in al-Zawahiri remarks on Benghazi" CNN, November 12, 2012. ^ Paul Cruickshank, Tim Lister and Nic Robertson, "Phone call links Benghazi attack to al Qaeda commander" CNN, March 5, 2013. ^ "Terrorist Designations of Ansar al-Sharia as an Alias for Al-Qaida in the Arabian Peninsula". Office of the Spokesperson, U.S. Department of State. October 4, 2012. Retrieved February 7, 2013. ^ David Kirkpatrick, "Suspect in Libya Attack, in Plain Sight, Scoffs at U.S." The New York Times, October 18, 2012. ^ a b Foster, Peter; Spencer, Richard (September 13, 2012). "US ambassador killed in Libya: investigators probe whether Benghazi assault was planned". The Daily Telegraph. London. Retrieved December 30, 2012. ^ a b Goodman, Alana (September 13, 2012). "Libya Attack Pre-Planned By Terror Group?". Commentary. Retrieved May 13, 2013. ^ Wehrey, Frederic (September 12, 2012). "The Wrath of Libya's Salafis". Sada. Retrieved December 30, 2012. ^ Lynch, Sara; Dorell, Oren (September 12, 2012). "Deadly embassy attacks were days in the making". USA Today. Retrieved December 30, 2012. ^ a b Bell, Larry (December 2, 2012). "Muslim Brotherhood Fox Was Hired To Protect Our Benghazi Consulate Henhouse – Interview". Forbes. Retrieved December 30, 2012. ^ "The Benghazi Timeline, Clinton Edition - FactCheck.org". June 30, 2016. Retrieved April 1, 2018. ^ Hosenball, Mark. "Clinton: Facebook post about Benghazi attack not hard". Retrieved April 1, 2018. ^ Elyan, Tamim. "Egyptians angry at film scale U.S. embassy walls". Retrieved April 2, 2018. ^ a b "Ansar al Shariah issues statement on US Consulate assault in Libya - FDD's Long War Journal". September 12, 2012. Retrieved April 1, 2018. ^ Elise Labott, "Report on Benghazi attack cites 'systemic failures'" CNN, December 19, 2012. ^ "Obama: U.S. consulate attack in Libya not an act of war". World Wide Pants. September 19, 2012. Retrieved December 18, 2012. ^ "Remarks by the President at Univision Town Hall with Jorge Ramos and Maria Elena Salinas". White House. September 20, 2012. Retrieved December 18, 2012. ^ "Spread of Protests Sparked by Anti-Muslim Video". Retrieved April 1, 2018. ^ "Benghazi suspect Ali Harzi released by Tunisia for lack of evidence, lawyer says" CBS News, January 8, 2013. ^ a b Thomas Joscelyn, "Video reportedly shows key suspect from Benghazi attack" The Long War Journal, October 31, 2012. ^ a b c Sioban Gorman, "Egyptians Detain Suspected Terrorist Ringleader" The Wall Street Journal, December 7, 2012. ^ U.S. Department of State (October 7, 2013). "Terrorist Designations of the Muhammad Jamal Network and Muhammad Jamal". U.S. Department of State. Archived from the original on January 4, 2014. Retrieved January 4, 2014. ^ United Nations Security Council (October 21, 2013). "Security Council Committee pursuant to resolutions 1267 (1999) and 1989 (2011) concerning Al-Qaida and associated individuals and entities". United Nations Security Council. Retrieved January 4, 2014. ^ Paul Cruickshank. Susan Candiotti and Tim Lister, "Sources: Benghazi suspect detained in Libya" CNN, March 14, 2013. ^ Bill Gertz, "Benghazi attack suspect walks: Libyans release key player in consulate ambush" The Washington Times, June 27, 2013. ^ Jomana Karadsheh; Holly Yan; Michael Pearson (July 15, 2014). "Where are the Benghazi suspects?". CNN. ^ "Statement regarding the events at US Consulate in Benghazi" (in Arabic). Libyan Prime Minister's Office. September 12, 2012. Archived from the original on September 12, 2012. Retrieved September 12, 2012. ^ "US ambassador, consul among 4 killed in militia attack on Benghazi consulate". Russia: RT. September 12, 2012. Retrieved September 12, 2012. ^ a b Worth, Robert F. (September 12, 2012). "Struggle for Ideological Upper Hand in Muslim World Seen as Factor in Attacks". The New York Times. ^ Robin Banerji, "Did Ansar al-Sharia carry out Libya attack?" BBC, September 12, 2012. ^ a b Eugene Kiely, "Benghazi Timeline", FactCheck, October 26, 2012. ^ "Remarks at Reception Marking Eid ul-Fitr". U.S. Department of State. September 13, 2012. Archived from the original on December 20, 2016. Retrieved July 11, 2016. ^ Armbruster, Ben (September 12, 2012). "Clinton: Libya Attacks By A 'Savage Group,' Not Libyan Government Or Its People". ThinkProgress. Retrieved September 13, 2012. ^ Loschky, Jay (August 18, 2012). "Opinion Briefing: Libyans Eye New Relations With the West". Gallup World Polling. ^ Murphy, Dan (December 26, 2011). "Eastern Libya poll indicates political Islam will closely follow democracy". The Christian Science Monitor. ^ "Survey of Public Opinion in Eastern Libya". International Republican Institute. Retrieved May 22, 2013. ^ "Belated Response From Egypt". The New York Times. September 14, 2012. ^ Bob Schieffer, ""Face the Nation" transcripts, September 16, 2012: Libyan Pres. Magariaf, Amb. Rice and Sen. McCain" CBS News, September 16, 2012. ^ Leila Fadel, "Consulate Attack Preplanned, Libya's President Says" NPR, September 16, 2012. ^ a b c "Protesting Libyans storm militant compound in backlash against armed groups". NBC News. Retrieved September 24, 2012. ^ a b c d e Urquhart, Conal (September 22, 2012). "Libyan protesters force Islamist militia out of Benghazi". The Guardian. London. Retrieved September 23, 2012. ^ "UPDATE 3-Libyan Islamist militia swept out of Benghazi bases". Reuters. September 22, 2012. Retrieved June 2, 2018. ^ a b c Osama Alfitory (September 24, 2012). "Libya orders militias to operate under government control or disband". The Denver Post. ^ a b c d e "Libyan forces raid militia outposts". Al Jazeera. September 23, 2012. ^ a b "Disbanding Libya's militias". Al Jazeera. September 24, 2012. ^ Karadsheh, Jomana (September 24, 2012). "Libyan troops raid rogue brigade's base". CNN. ^ a b "Libya's army evicts unauthorized militias". CNN. September 25, 2012. ^ "Hundreds of Libyans hand over their weapons". USA Today. September 29, 2012. ^ "Libyan militias amass weapons as rivalries surface". The National. September 23, 2012. ^ Compton, Matt (September 12, 2012). "President Obama Discusses the Attack in Benghazi, Libya". The White House. Retrieved September 14, 2012. ^ a b c d e "Remarks by the President on the Death of U.S. Embassy Staff in Libya". White House. September 12, 2012. Retrieved September 22, 2012. ^ "US Marine anti-terrorism team heads to Libya: official". Agence France-Presse. September 12, 2012. Retrieved September 12, 2012. ^ "Marine anti-terrorism team dispatched to Libya after diplomats killed". Stars and Stripes. September 12, 2012. Retrieved July 28, 2015. ^ a b "U.S. launching apparent terrorist hunt in Libya". CBS News. September 13, 2012. ^ Spetalnick, Matt; Hadeel Al Shalchi (September 12, 2012). "Obama vows to track down ambassador's killers". Reuters. Retrieved November 5, 2012. ^ Solomon, John (September 12, 2012). "Years of warning about embassy security preceded Libya attack". Washington Guardian. Archived from the original on October 28, 2012. Retrieved November 5, 2012. ^ "U.S. vows to hunt down perpetrators of Benghazi attack". CNN. September 12, 2012. Archived from the original on October 4, 2012. Retrieved November 6, 2012. ^ "U.S. struggles to determine whether Libya attack was planned". CNN. September 13, 2012. Retrieved September 13, 2012. ^ "Remarks by the President in Golden, CO". The White House. September 13, 2012. Retrieved October 18, 2012. ^ "Press Briefing by Press Secretary Jay Carney, 9/14/2012". The White House. September 14, 2012. Retrieved October 18, 2012. ^ ""Face the Nation" transcripts, September 16, 2012: Libyan Pres. Magariaf, Amb. Rice and Sen. McCain". CBS News. September 16, 2012. Retrieved September 23, 2012. ^ "Ambassador Susan Rice: Libya Attack Not Premeditated". ABC News. September 16, 2012. Retrieved September 23, 2012. ^ "Ambassador Rice spends Sunday reinforcing White House position that Middle East violence was 'spontaneous'". Fox News Channel. September 16, 2012. Retrieved September 23, 2012. ^ "Transcripts, State of the Union with Candy Crowley, interview with Susan Rice". CNN. September 16, 2012. Retrieved September 23, 2012. ^ "September 16: Benjamin Netanyahu, Susan Rice, Keith Ellison, Peter King, Bob Woodward, Jeffrey Goldberg,". NBC News. September 16, 2012. Retrieved September 23, 2012. ^ a b c "House intel panel debunks many Benghazi theories". Retrieved April 1, 2018. ^ "Press Briefing by Press Secretary Jay Carney, 9/18/2012". September 18, 2012. Retrieved October 18, 2012. ^ "As Carney labels Libya strike terrorism, Obama continues to incorrectly cite anti-Islam film". Fox News Channel. September 20, 2012. ^ "Obama's Responses To Libya Questions At Univision Forum Contradicted By Reports Of The Attack". Mediaite. September 20, 2012. ^ "Obama pressed on failures at Univision forum". Politico. September 20, 2012. ^ Parsons, Christi (September 20, 2012). "Obama defends embassy security during Univision town hall". Los Angeles Times. ^ "Univision's Town Hall Meeting With President Obama". Real Clear Politics. September 20, 2012. ^ Rogin, Josh (September 20, 2012). "Republican senators decry 'useless, worthless' Clinton briefing on Libya attack". Foreign Policy. Retrieved September 22, 2012. ^ Bolton, Alexander (September 22, 2012). "Senate GOP furious newspaper got better briefing on Libya". The Hill. Retrieved September 22, 2012. ^ "Anti-film ads in Pakistan feature Obama, Clinton". CBS News. September 24, 2012. Retrieved June 19, 2014. ^ "Transcript: President Obama Talks to the U.N. about Mideast Peace, Iran". September 27, 2012. Retrieved October 12, 2012. ^ "Remarks by the President to the UN General Assembly". Office of the Press Secretary. White House. September 25, 2012. Retrieved June 3, 2013. ^ "Transcript: Obama address to U.N. General Assembly". Fox News Channel. September 25, 2012. Retrieved June 3, 2013. ^ "Statement by the Director of Public Affairs for the Director of National Intelligence, Shawn Turner, on the intelligence related to the terrorist attack on the U.S. Consulate in Benghazi, Libya" (PDF). Office of the Director of National Intelligence. September 28, 2012. Retrieved October 13, 2012. ^ "Producer of anti-Islam film arrested, ordered held without bail". CNN. September 28, 2012. Retrieved May 30, 2014. ^ "State of the Union with Candy Crowley, Interview with John McCain; Interview with David Axelrod; Interview with Martin O'Malley, Roy Blunt". CNN. September 30, 2012. Retrieved October 15, 2012. ^ "FBI came to Benghazi and left in past 24 hours". Associated Press. October 4, 2012. Retrieved May 22, 2013. ^ "Whistle-blower: Botched talking points hurt FBI probe of Benghazi attack". Fox News Channel. May 8, 2013. Retrieved May 9, 2013. "The latest on Benghazi hearing". CNN. May 8, 2013. Retrieved June 3, 2013. ^ Schmitt, Eric (October 15, 2012). "U.S. to Help Create an Elite Libyan Force to Combat Islamic Extremists". The New York Times. ^ "CNN Fact Check: A day after Libya attack, Obama described it as 'acts of terror'". CNN. October 17, 2012. Retrieved July 3, 2013. ^ Monroe, Bryan (October 20, 2012). "The truth about what Candy Crowley said". CNN. Retrieved December 3, 2013. ^ a b c Kesller, Glenn (May 14, 2013). "Obama's claim he called Benghazi an 'act of terrorism'". The Washington Post. Retrieved May 19, 2013. ^ Josh Rogin, "Issa's Benghazi document dump exposes several Libyans working with the U.S." Foreign Policy, October 19, 2012. ^ ""Face the Nation" transcripts, October 28, 2012: McCain and Emanuel". CBS News. October 28, 2012. ^ "U.S. military poised for rescue in Benghazi". CBS News. Retrieved May 14, 2013. ^ "Interview with Senator McCain re Benghazi". Hugh Hewitt. October 29, 2012. Archived from the original on February 22, 2014. Retrieved January 16, 2014. ^ "Hillary Clinton Benghazi Testimony Postponed After Secretary Of State Sustains Concussion". The Huffington Post. December 15, 2012. ^ "Rep. Allen West accuses Hillary Clinton of faking concussion to avoid Benghazi testimony". New York Daily News. December 20, 2012. ^ "In Context: Hillary Clinton's 'What difference does it make' comment". Tampa Bay Times. May 7, 2013. Retrieved July 16, 2015. ^ Walker, Mark (March 15, 2013). "Medal Proposed for Ex-SEALs". U-T San Diego. Archived from the original on April 12, 2013. Retrieved March 15, 2013. Herb, Jeremy (March 15, 2013). "Hunter wants Congressional medal awarded to slain Benghazi SEALs". The Hill. Retrieved March 15, 2013. "H.R.1186 – To posthumously award the Congressional Gold Medal to each of Glen Doherty and Tyrone Woods in recognition of their contributions to the Nation". United States Congress. March 14, 2013. Retrieved March 15, 2013. ^ Starr, Barbara (April 2, 2013). "After Benghazi, Marines approved for crisis response force". CNN. Retrieved April 21, 2013. ^ "Spain authorizes U.S. rapid reaction force in south". Army Times. Gannett Government Media. Associated Press. April 19, 2013. Retrieved April 21, 2013. ^ Kesller, Glenn (March 1, 2011). "About the Fact Checker". The Washington Post. Retrieved July 3, 2013. ^ "H.R. 2848 – All Actions". United States Congress. Retrieved September 30, 2013. ^ "House Report 113-226" (PDF). United States House Committee on Foreign Affairs. Retrieved September 30, 2013. ^ Green, J.J. (September 13, 2012). "Congressman: Consulate attack in Libya was coordinated". WTOP. Retrieved November 5, 2012. ^ "Intelligence chairman doubts Libya attack linked to video". CNN. September 23, 2012. ^ "The Benghazi Transcripts: US military woefully unprepared for attack, documents show". Fox News Channel. January 14, 2014. Retrieved May 30, 2014. ^ Barrett, Wayne (October 22, 2012). "Romney Campaign, Media Collude in Unprecedented Politicization of Benghazi Attack". The Nation. Retrieved September 5, 2013. ^ Miller, Zeke J (May 10, 2013). "White House: GOP Focus On Benghazi Tied To Mitt Romney". Time. Retrieved September 5, 2013. ^ Talev, Margaret (October 15, 2012). "Ambassador's dad says son's death in Libya shouldn't be politicized". The Plain Dealer. Cleveland. Retrieved September 5, 2013. ^ "Gates: Some Benghazi critics have "cartoonish" view of military capability". CBS News. Retrieved May 14, 2013. ^ Saenz, Arlette (May 13, 2013). "President Obama Dismisses Benghazi Criticism as 'Sideshow'". ABC News. Retrieved May 19, 2013. "Obama calls Benghazi controversy a 'sideshow'". Fox News Channel. May 13, 2013. Retrieved May 19, 2013. ^ Schwartz, Ian (July 31, 2013). "Carney Identifies Which Scandals Obama Thinks Are Phony: Benghazi And IRS". RealClearPolitics. Retrieved September 5, 2013. ^ "Investigative Report on the Terrorist Attacks on U.S. Facilities in Benghazi, Libya, September 11–12, 2012" (PDF). United States House Permanent Select Committee on Intelligence. Retrieved July 17, 2015. ^ Rogers, Mike (December 10, 2014). "The House Intelligence Committee's report on Benghazi (op-ed)". The Hill. Retrieved July 17, 2015. ^ Vanden Brook, Tom (May 16, 2016). "Navy SEALs secret medals reveal heroism during past 15 years". USA Today. Retrieved April 23, 2018. Scarborough, Rowan (November 16, 2013). "Delta Force Marine awarded Navy Cross for fight at CIA annex in Benghazi". Washington Times. Retrieved April 23, 2018. "2 US commandos involved in Benghazi rescue to be privately honored for bravery". Fox News. November 1, 2013. Retrieved April 23, 2018. ^ Dinan, Stephen (November 2, 2012). "Study: Media accepted Obama version of Benghazi attack". The Washington Times. Retrieved June 3, 2013. ^ Bump, Philip. "The Benghazi Memo Drafts, as They Evolved". Retrieved April 1, 2018. ^ "The Rachel Maddow Show". MSNBC. September 13, 2012. ^ "Americans poorly served by media on Iraq, Benghazi". Retrieved June 25, 2014. ^ "Maddow: U.S. Got the Suspect and 'Benghazi Central' Fox News Doesn't Care?". Retrieved June 25, 2014. ^ Hosenball, Mark (October 23, 2012). "White House told of militant claim two hours after Libya attack: emails". Reuters. Retrieved June 21, 2013. ^ Schmitt, Eric (October 23, 2012). "E-Mails Offer Glimpse at What U.S. Knew in First Hours After Attack in Libya". The New York Times. Retrieved June 21, 2013. ^ "Krauthammer: Lack of Benghazi media coverage 'a journalistic scandal'". The Daily Caller. October 25, 2012. ^ "Benghazi: No 'October Surprise'". National Review. October 31, 2012. ^ "October 28: John Kasich, Scott Walker, John Hickenlooper, E.J. Dionne, Rachel Maddow, Carly Fiorina, David Brooks". MSNBC. October 28, 2012. Retrieved December 18, 2012. ^ Weinger, Mackenzie (November 26, 2012). "Tom Ricks to Fox News: The network operates 'as a wing of the Republican Party'". Politico. Retrieved December 11, 2012. ^ Wemple, Erik (November 27, 2012). "Ricks: Fox doesn't care about story behind Benghazi story". The Washington Post. Retrieved December 11, 2012. ^ Wemple, Erik (December 6, 2012). "Does Fox News's Ed Henry agree with Tom Ricks?". The Washington Post. Retrieved December 11, 2012. ^ Bauder, David (December 6, 2012). "Ed Henry: Some Fox News Shows Covered Benghazi 'More Than It Needed To Be'". The Huffington Post. Retrieved December 11, 2012. ^ CNN, Manu Raju, Deirdre Walsh and Tal Kopan,. "House Republicans repudiate Kevin McCarthy comments - CNNPolitics". Retrieved April 2, 2018. ^ "Rep. Kevin McCarthy how he would differ from John Boehner". Fox News. September 29, 2015. Retrieved April 2, 2018. ^ http://www.state.gov, U. S. Department of State: (December 19, 2012). "Accountability Review Board (ARB) Report [Benghazi Report of December 19, 2012]" – via www.hsdl.org. ^ Gearan, Anne; Miller, Greg (December 19, 2012). "Four State Dept. officials disciplined after Benghazi probe". Retrieved April 2, 2018 – via www.washingtonpost.com. ^ "House Benghazi committee files final report and shuts down". Retrieved April 2, 2018. ^ Phillips, Amber (June 28, 2016). "The 5 most serious accusations from Republicans' Benghazi report". Washington Post. Retrieved February 16, 2019. ^ "House intel panel debunks many Benghazi theories". Retrieved April 2, 2018. ^ "Judicial Watch Obtains First Photos from State Department Depicting Aftermath of Benghazi Attack". Judicial Watch. June 21, 2013. Retrieved August 23, 2012. ^ Martosko, David (June 20, 2013). "'Allah-u-Akbar': State Department unclassifies first official photos from aftermath of Benghazi attack, including jihadi graffiti left behind". Daily Mail. London. Retrieved August 23, 2012. ^ "RNC Files FOIA Request for Benghazi Emails Between State Dept. and Obama 2012 Campaign". Human Events. May 30, 2013. Retrieved August 23, 2012. ^ "Judicial Watch: Benghazi Documents Point to White House on Misleading Talking Points". Judicial Watch. April 18, 2014. Retrieved April 29, 2014. ^ Jay Sekulow. "Benghazi emails: Proof Obama White House put politics ahead of truth". Fox News Channel. ^ "Documents obtained through FOIA" by Judicial Watch. Retrieved May 4, 2014. ^ "Knopf Email on Toria Nuland Information Page 2". Judicial Watch. ^ "The missing Benghazi email". The Wall Street Journal. April 30, 2014. Retrieved May 28, 2014. ^ "Lies, Damned Lies, and Garden-Variety Self-Deception" by John Dickerson. Retrieved May 4, 2014.